Tupton supposedly derives from “Topi’s Tun“, “Topi” being a person’s name, and “tun” meaning a small farm. From this Anglo-Saxon word “tun” comes our modern word “town”. Tupton lies on the Roman road Ryknield Street, an obvious place for a settlement, and has an Anglo-Saxon name. It seems likely that the original settlement was founded between 550 A.D. and 878 A.D. Some of the trees near Tupton Hall are reputed to be about a thousand years old; it is possible that “Topi’s Tun“, later “Topetune” was near the site of Tupton Hall. 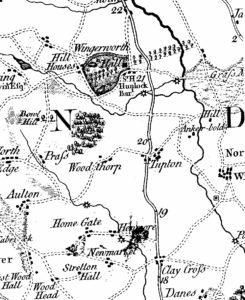 The name Woodthorpe is derived from “Wudethorp“, “wade” meaning wood or forest (Anglo-Saxon) and “thorp” meaning settlement (Danish). 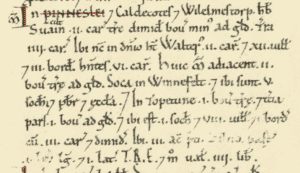 The Danish element seems to indicate that Woodthorpe was founded after 878 A.D., for the Danes like the Angles pushed across the country from East to West, splitting Derbyshire between English and Danish Mercia. Unfortunately we have no records of the owners of Tupton and Woodthorpe at this time. Saxon Land Charters are rare: many of those in existence for various parts of England are spurious. For Egstow however, we have the name of a pre-Conquest owner, one Levendt, the Domesday Book (1086) supplying the information. “In Stratune (Stretton) and Tegestore (Egstow) and Henlege (Handley?) Levendt had i car v cate Ledable”. Another entry in the book might indicate Dolfin as the owner of part of Tupton at this time, but it is not certain. Tupton Hall was destroyed by fire in 1938. Total population: 6.2 households (quite small). Value to the Lord: Value to lord in 1066 £4. Value to lord in 1086 £4. Households: 20 villagers. 4 smallholders. 6 freemen. 1 priest. Ploughland: 4 ploughlands (land for). 2 lord’s plough teams. 9.5 men’s plough teams. Other resources: Meadow 3 acres. Woodland 1 * 1 leagues. 1 church. Tenant in chief in 1086: Walter of Aincourt.